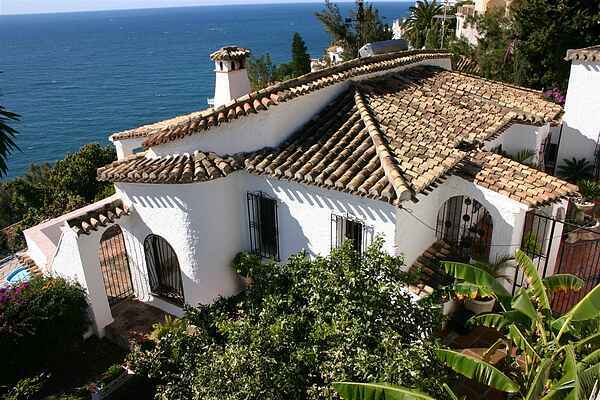 Casa Lobo is a luxury villa in Salobrena, build in traditional Andalucian style and situated in the quiet and very private Urbanisation Costa Aguilera Mar. The views from all principal rooms are simply stunning! Our private heated pool can be used even in Winter and heating of the pool is included in the rent. Heating comes from big solar panels. In the period from November untill Easter use of our outdoor jacuzzi for 7 persons is also included in the rental. The villa is situated between the charming spanish cities Almuñecar and Salobreña with great beaches, restaurents and tapasbars. The distance to golfing is short (7 km) and the famous Alhambra can be reached in less than 1 hour. The villa has its own private, heated pool surrounded by terraces and a mature garden with excellent seaview. Located on a plot with no major roads between this property and sea this villa is close enough to the sea to see the dolphins playing below. The approach from the entrance gate at road level to the front door is via a pretty entrance patio just a few steps down from the road and garage level. This walled courtyard area with the Spanish fountain sets the property away from the street and provides privacy. From this area you can go around the property to the pool area and surrounding gardens or to the upper garden area with its barbeque area and the build in Argentinian Barbeque surrounded by fruit trees. The villa has an open plan dining and living area which are on two levels with a separate kitchen adjacent to the dining area on the upper level. Close to the entrance there is a bathroom with shower. The dining area overlooks the living area and on descending a small number of steps you enter the open living area with high ceilings and large windows which means the area remains bright and open with views south, along the Costa Tropical, Salobrena beach and to the rock on which the castle in Salobrena sits. In the corner of the room there is a wood burning stove, which is ideal for the cooler evenings in the winter adding both heat and atmosphere to the property. There is easy access on this level to a very private terrace with its own external fireplace allowing the residents to spend more time outside in the evenings and nights throughout the year. Part of the terrace is covered which avoids too much light entering the living area directly, keeping it cooler as well as providing useful shelter from the sun when relaxing outside. From this terrace some of the best views can be enjoyed while you enjoy breakfast, lunch or dinner overlooking the ever changing sea. Below this level there are 3 bedrooms and two bathrooms. The main bedroom is located furthest from the pool. All bedrooms have secure double doors which open onto the lower terraces which have many mature hibiscus plants. At this level there is a private swimming pool which has its own surrounding terrace ideal for lying in the sun. In the spring 2011 there have been made new terraces with great views over the Mediterranean. From this part of the garden you can enjoy the sunsets so close to the sea, that you can hear the waves. Many new fruittrees have also been planted in this part of the garden to supply the mature fruittrees. Around the villa there are various storage areas including a utility area with a washing machine and a small discrete terrace to dry the washing naturaly with the sea breeze and Mediterranean sunshine. At street level there is a garage and off-road parking for a second car. Casa Lobo - the perfect choice of villa for a lovely holiday! We have an outdoor jacuzzi (Hotspring) for 7 people in the garden. The use of the jacuzzi is an optional extra.